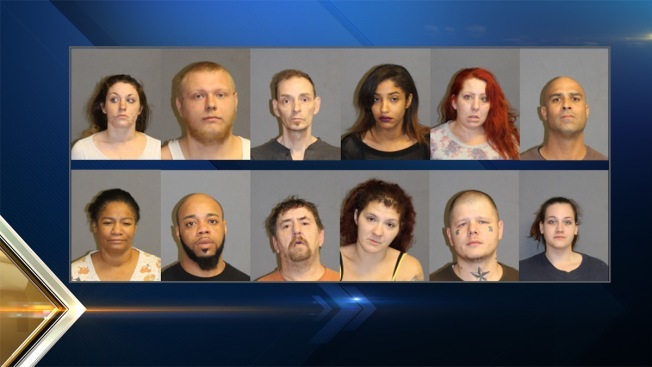 Pictured are 12 of the 14 people arrested in a recent drug sweep in Nashua, New Hampshire. Police in Nashua, New Hampshire arrested 14 people on heroin and crack cocaine related charges during a recent drug sweep. The arrests were made during the second week of December, with assistance from the New Hampshire Drug Enforcement Administration and the FBI's gang task force. All had active arrest warrants for distributing drugs in Nashua. Jane Dussault, 19, of 4 Autumn Leaf Dr., Apartment 9, Nashua, on three counts of acts prohibited; sale of a controlled drug, heroin, second offense. She was transferred to the Hillsborough County House of Corrections where she was held on $75,000 cash or surety bail and scheduled for arraignment on Dec. 9 in Nashua District Court. Nicholas Lepine, 19, of 72 Chestnut St., Apartment 1, Nashua, on one count of acts prohibited; sale of a controlled drug, cocaine. He was released on $5,000 cash bail and scheduled for arraignment on Jan. 12 in Nashua District Court. Michael Marquis, 49, of 29 Temple St., Apartment 214, Nashua, on three counts of acts prohibited; sale of a controlled drug, heroin. He was transferred to the Hillsborough County House of Corrections as he refused bail and scheduled to be arraigned on Dec. 9 in Nashua District Court. Topacio Baez, 27, of 1 Beauview, Apartment 25, Nashua, on three counts of sale of a controlled drug, cocaine. He was released on $5000.00 cash or surety bail and scheduled for arraignment on Jan. 12 in Nashua District Court. Angela Peno, 39, of 42 Kinsley St., Apartment 8, Nashua, on two counts of acts prohibited; sale of a controlled drug, heroin, second offense, one count of possession of a controlled drug with the intent to distribute, heroin, second offense and one count of possession of a controlled drug, Ritalin, second offense. She was held at the Hillsborough County Department of Corrections on $75,000 cash or surety bail and scheduled for arraignment on Dec. 9 in Nashua District Court. Wilfredo Cruz, 40, of 29 Kinsley St., Nashua, on two counts of acts prohibited; sale of a controlled drug, cocaine, second offense, and one count of criminal liability for the conduct of another to acts prohibited; unlawful sale of a controlled drug, cocaine. He was transferred to the Hillsborough County House of Corrections with a $75,000 cash or surety bail and scheduled to be arraigned on Dec. 9 in Nashua District Court. Sonya Nedd, 52, of 26 Hanover St., Apartment A, Nashua, on three counts of acts prohibited; sale of a controlled drug, crack cocaine, second offense. She was transferred to the Hillsborough County House of Corrections with a $75,000 cash or surety bail and scheduled to be arraigned on Dec. 9 in Nashua District Court. Richard Smith, 31, of 1 Tolles St., Nashua, on two counts of sale of a controlled drug, heroin. He was held on $10,000 cash or surety bail and held at the Hillsborough County Department of Corrections with a scheduled arraignment date of Dec. 9 in Nashua District Court. James Campbell, 54, of 46 Spring St., Apartment 3, Nashua, on four counts acts prohibited: sale of controlled drug, crack cocaine. He was held at the Hillsborough County Department of Corrections on $100,000 cash bail and scheduled for arraignment on Dec. 9 in Nashua District Court. Jessica King, 30, of 7 Hanover St., Apartment B, Nashua, on two counts of acts prohibited; sale of a controlled drug, heroin, and two counts of acts prohibited; sale of a substance representative of heroin. She was transferred to the Hillsborough County House of Corrections with a $75,000 cash or surety bail and scheduled for arraignment on Dec. 9 in Nashua District Court. Lawrence Nelson, 30, of 104 Walnut St., Apartment 7, Nashua, on one count of acts prohibited; sale of a controlled drug, crack cocaine, second offense, and one count of acts prohibited; sale of a controlled drug, docaine, second offense. He was transferred to the Hillsborough County House of Corrections with a $50,000 cash or surety bail and scheduled for arraignment on Dec. 9 in Nashua District Court. Andrea Shamp, 23, of 38 Hood Rd., Brookline, on one count of acts prohibited; possession of controlled drug, heroin. She was released on $200 cash bail and is scheduled for arraignment on Jan. 21 in Nashua District Court. Daniel Hebert, 59, of 373 Lafayette Rd., Apartment 204, Hampton, on four counts of sale of a controlled drug, heroin, second offense. He was held on $100,000 cash or surety bail and scheduled for arraignment on Dec. 10 in Nashua District Court. Ulysses McMillan, 29, of 14 Newland Ave., Hudson, on two counts of acts prohibited; sale of a controlled drug, heroin, second offense. He was transferred to the Hillsborough County House of Corrections with a $50.000 cash bail and scheduled for arraignment on Dec. 10 in Nashua District Court.